Home > WhatsApp Tips and Tricks > How to Record WhatsApp Call on Android? Why Would You Need WhatsApp Call Recorder? As most of our conference and one-to-one video calls take place in WhatsApp messenger, a call recorder app is much needed. That won’t add up any quality audio or visual effects to your HD calling, but it can be useful in other ways. Let me tell you how. Call recordings can be handy at many times. Suppose, you want to recall the conversation you had with your friends which carries some important information. Now, if it was text message, you could check the conversation history. But it isn’t. So instead of asking your friends again, which might not be accessible, you could easily go through the call records history and find what was needed. Let’s take another scenario where you have to prove something and the only evidence could be your WhatsApp call. A wicked person might prefer to call you on WhatsApp or other messengers because call recording is not a commonplace action there. If you have the recorder apps already, you can definitely prove your point easily. Can WhatsApp Calls be Recorded? In recent times, almost all the messenger apps have incorporated video and audio calling as their leading feature. As much as they are trying to develop the audio-visual quality of online calling, none of these applications have paid any attention to the call recording feature. Most of us have the smartphone benefit of recording the audio while we are on a call through our service provider connection (SIM connection). But it’s the blooming age of WiFi and fast internet. “No signal” and random call disconnections are on their way of extinction, as internet calling is taking its place. Now the question appears, “can you record WhatsApp calls?” Yes! You definitely can do that with the help of these multi-utility applications we have listed in this article. Tip: You may also want to record phone calls on Android. WhatsApp seems to be recording calls and saving the data on your phone since the beginning. Have you noticed the fact that a sub-folder is there under your WhatsApp folder (in SD Card) named “WhatsApp Calls”. Although everyone has the folder existing in their mobiles, but for most of you, the folder will be empty. In that case, you have to download 3rd party WhatsApp call recorder Android apps and use them instead. Here we have given detailed features of the three exclusive WhatsApp recorder apps that totally fit your purpose. 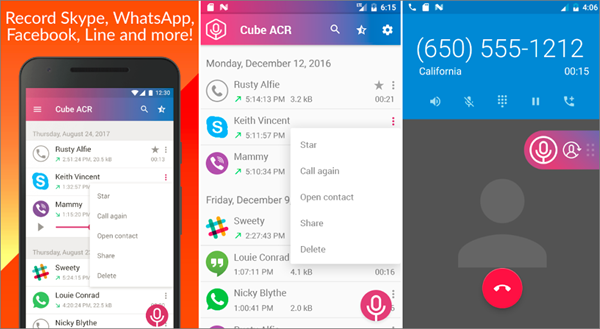 It’s one of the most popular apps to record audio calls that can be used simultaneously to download the data of your audio calls from all the messengers like Facebook messenger, Skype, Viber, etc. So the utility of Real call is not only limited to WhatsApp alone. It can be used to record both the incoming and outgoing calls. Real Call records the entire conversation automatically and saves it in the SD Card of your mobile in the most accessible audio format of .Mp3. Therefore, it becomes easy to play the recording any time and from any device. 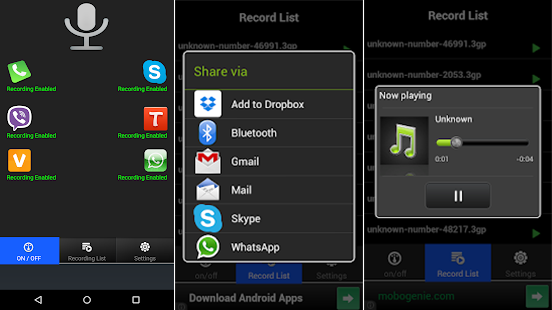 This app is capable of sharing those recordings directly on popular social media platforms. 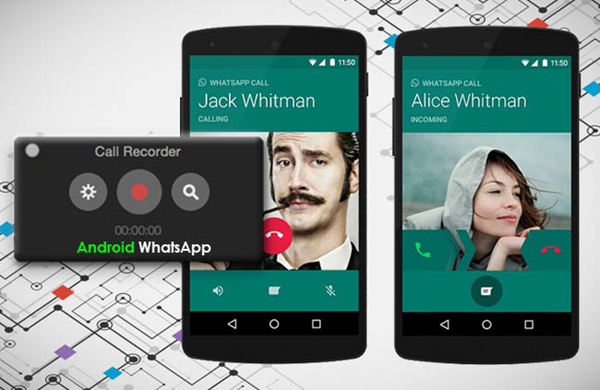 Open the Real Call app from Google Play Store, and choose WhatsApp and enable recording. If you wish to enable the feature for another messenger, enable it too. Unless you choose the app, all incoming and outgoing calls will get recorded automatically. You can browse the files in the recording list of the app. This is another great way of recording WhatsApp calls automatically and permanently saving them to your mobile phone. 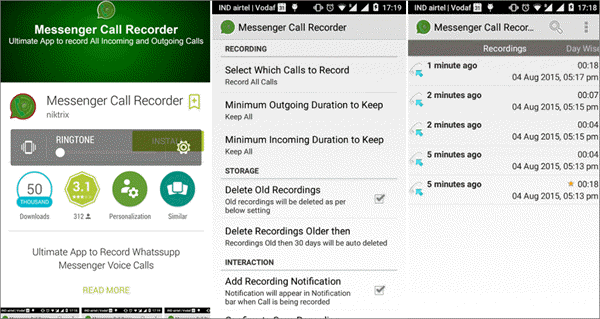 Messenger Call Recorder application has many similarities to the app we have discussed above. But, one big advantage of choosing this app is that it consumes less battery and phone memory. Messenger Call Records the calls with high definition sound quality along with less battery power consumption. So there’s a complete assurance that your mobile’s battery won’t drain too fast because of this app running constantly in the background. Set the preference for minimum duration of calls to record to get rid of unnecessary recordings automatically. This app is very useful in terms of keeping records, because you can use it to record both your phone calls and messenger calls like WhatsApp, Skype, Imo, Line, Telegram, etc. If you don’t have an internal call recording option for your phone calls, this multi-function app is exactly what you need. You will get to download this app easily from Google Play store. Cube ACR adds a floating icon on your screen once you install it into your phone. Using this, you can choose before every call whether you want to download it or not. How to Record WhatsApp Video Call? There is no app to directly record your video calls on WhatsApp, but you can satisfy your requirement by capturing the screen during the video call using the common Android phone screen recorder apps. These apps are primarily used to record the on-screen activities. But there are some apps that let you record the video along with the audio. You can turn the application on and it will act as a WhatsApp video recorder. Note: If your recording files are lost by accident, do remember to stop using your Android any more, otherwise the deleted files will be overwritten and unrecoverable. Then use this trick to recover deleted videos and audios from Android device. Try out our recommendations and get one step ahead in using the latest technologies for WhatsApp. How to Fix “Sorry, this media file doesn’t exist on your SD card/internal storage”?